Tourism in Tewkesbury clearly benefits from the buildings featured in the novels of Charles Dickens, Mrs. Craik and John Moore‘s ‘Brensham Trilogy', based on Tewkesbury and the surrounding area. Researchers, however, can only work on contemporary writings, artefacts and records; where any of these are missing care has to be taken not to use coincidence to infer facts, but it can be used to stimulate debate which can sometimes bring information to light! One such coincidence came to light in Tewkesbury in the course of research into the life and travels of J.M.W.Turner, R.A. in the West Midlands. Turner stayed in Tewkesbury for a short time in 1793. He and his father owned a burgage, now Turner's Court off Church Street1. Turner was a great friend of Dickens, and the two frequently dined together in London. Charles Dickens referred to the Hop Pole at Tewkesbury in The Pickwick Papers. Isn’t it a strange coincidence that the house near the Hop Pole on the comer of St. Mary’s Lane, where a schoolmaster named William Turner (not related to the painter) lived, has been called The Old Curiosity Shop? A further coincidence is that on the opposite comer of St. Mary’s Lane is the oldest medieval domestic building2 in the town, a vaulted cellar. Dickens featured a strange shop and a vaulted cellar in his novel, The Old Curiosity Shop. Did Turner tell Dickens about the vaulted cellar and the old buildings in Tewkesbury, including the Hop Pole ? Or did Dickens come here to see for himself? Did he predict that the old house would be pulled down, as happened about 1870? The Old Curiosity Shop ends when the old man returns to find the house demolished and the road widened. The following is an account of many months’ research, prompted first by curiosity, supported by a request from the present owner of the Curiosity Shop, Alan Cresswell, and finally by an interest in this country’s most prolific and talented artist, J .M.W.Turner. This is a twin-gabled, four-storey building of sixteenth century origin3. The house was originally built with its front at right-angles to Church Street so that it faced towards the Cross. There are many other properties built in this way in Tewkesbury, and the side entry to the front door via an alley is a feature of the town. The property was changed by infill building which joined it to the Riverside Hotel, now part of the Hop Pole. The end wall fronting Church Street was altered to give access and shop fronts. It has now been split into four flats above and behind, and two shops with cellars. I The research on the property was carried out by Derek Round after he had completed the renovation of the fireplaces for Alan Cresswell, the local hairdresser and owner of one of the shops. The renovation involved the removal of plasterwork and studding, which revealed fine back-to-back inglenook fireplaces, which have now been restored. They comprise a large grated fireplace which faces the road, backed by the baking oven in the old kitchen. The oak beam across the front of the fireplace has smoke burns where candle or oil lamps were fixed to it. The holes of the fixing nails can be seen directly below the burns. There are no burn marks on the front of the baking oven beam, but there is evidence of a lamp having been used behind the beam over the open_,fire. The original fireback has been refitted, but the firegrate was crushed by the bricks that fell down the chimney when the stacks were lowered. A Victorian pattern firegrate obtained from Ronsons has been fitted. The damaged firegrate was beyond repair, and so far attempts to establish its age have been unsuccessful. Some time ago the two front flues broke their backs, so that they could not be used, so the two fireplaces were filled up. The front one was filled with old Tewkesbury hand-made bricks and lime mortar. The baker’s oven was filled with London bricks and cement, showing that it was in use until much later. All the chimneystacks have been removed down to attic level. The rubble was dropped down the stacks and had to be removed to allow the restoration to start. In 1787 there was another property in the lane adjacent to No. 90 which would have made the lane only eight feet across at its widest point, and this on a major route through Tewkesbury to Gloucester! 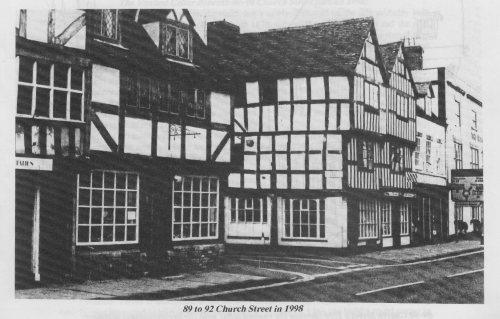 The published article continues with 89-90 Church Street and the Vaulted Cellar Beneath and JMW Turner: His Presence in Tewkesbury. James London Chandler; Head; Widower; Male; 36; Tailor; Born Kemerton Glos. Emily Mc Minn; Head; Widow; Female; 28; Grocer; Born Tewkesbury Glos. James Mc Minn; Son; Male; 5; Born Stratford( Unclear Possibly Shalford) Essex. Ellen Warren; Servant; Female; 12; House Servant; Born Hasfield Glos. Samuel W. Barber; Head; Widower; Male; 67; Gardener Employing 3 Men; Birthplace Not Known. Sarah Kilminster; Daughter; Married; Female; 32; Shopkeeper; Born Tewkesbury Glos. Ann Kilminster; Granddaughter; Female; 4; Born Tewkesbury Glos. Elizabeth Kilminster; Granddaughter; Female; 2; Born Tewkesbury Glos. Sarah Kilminster; Granddaughter; Female; 3months; Born Tewkesbury Glos. Ellen Knight; Servant; Single; Female; 22; General Servant; Born Strensham Worcs. Joseph Turner; Lodger; Married; Male; 36; Gardener; Birthplace Not Known. William Heath; Head; Married; Male; 38; Gardener & Greengrocer; Born Twyning Glos. Sarah Heath; Wife; Married; Female; 39; Gardener & Greengrocer; Born Tewkesbury Glos. William Heath; Son; Male; 10; Scholar; Born Twyning Glos. Sarah Kilminster; Daughter-in-law; Female; 10; Scholar; Born Tewkesbury Glos. Thomas Kilminster; Son-in-law; Male; 7; Scholar; Born Tewkesbury Glos. John Heath; Son; Male; 3; Scholar; Born Tewkesbury Glos. Samuel Heath; Son; Male; 1month; Born Tewkesbury Glos. Myra Shurmer; Servant; Female; 13; House Servant; Born Tewkesbury Glos. William Lawrence; Head; Married; Male; 50; China Dealer; Born Tewkesbury Glos. Martha Lawrence; Wife; Married; Female; 44; Born Kingscott (sic) Kingscote? Glos. Martha Lawrence; Daughter; Single; Female; 12; Scholar; Born Tewkesbury Glos. William Lawrence; Son; Single; Male; 7; Scholar; Born Tewkesbury Glos. William Lawrence; Head; Married; Male; 62; China Dealer; Born Tewkesbury Glos. Martha Lawrence; Wife; Married; Female; 50; Born Tarlton (or Harlton Or Haslton) Glos. William Lawrence; Son; Single; Male; 17; Saddler; Born Tewkesbury Glos. Martha Lawrence; Daughter; Single; Female; 22; Dressmaker; Born Tewkesbury Glos. William Lawrence; Head; Widower; Male; 72; China Dealer;b. Tewkesbury Glos; Working On Own Account.